Organized crime is a fairly new criminal policy issue in Germany. It was first raised during the 1960s when the conceptualization was guided by the official American view of organized crime as a rationally-designed, violent, and powerful criminal organization. It was generally agreed that nothing of this sort existed in Germany. On these grounds it could only be argued that organized crime posed a potential threat for the future. One scenario saw foreign crime syndicates extending their spheres of influence into Germany (Beuys, 1967). Another scenario envisioned an independent development of crime similar to the evolution of organized crime in the United States (Mätzler, 1968). In the 1970s a third solution to the conflict between concept and reality was suggested in the form of a uniquely German definition of organized crime distinct from the syndicate model (Kollmar, 1974). This view eventually prevailed, leading to a broad conceptualization of organized crime that encompasses almost all crimes that require the cooperation of several persons. ...the initial question for organized crime research in Germany was whether there was a significant enough change to justify the abandonment of the traditional professional criminal concept in favor of a new concept of "organized crime". ...German studies indicate an evolutionary process starting in the 1960s along two distinct lines: On the one hand, the underworld as a network of criminally exploitable contacts underwent a process of vertical and horizontal differentiation without developing lines of command or clearcut organizational units. On the other hand, groups of foreigners who operate from within Germany or from outside and have not been absorbed by the underworld network, emerged as apparently cohesive units with an authoritarian hierarchy. A series of graphical presentations will be used to depict these processes.
" and the stratification of actors within the crime network. Individual potential. Actors may have different attributes that are relevant to their position in the crime network. The most important seem to be professional skills, financial strength, and leadership qualities (Rebscher & Vahlenkamp, 1988). 1.) 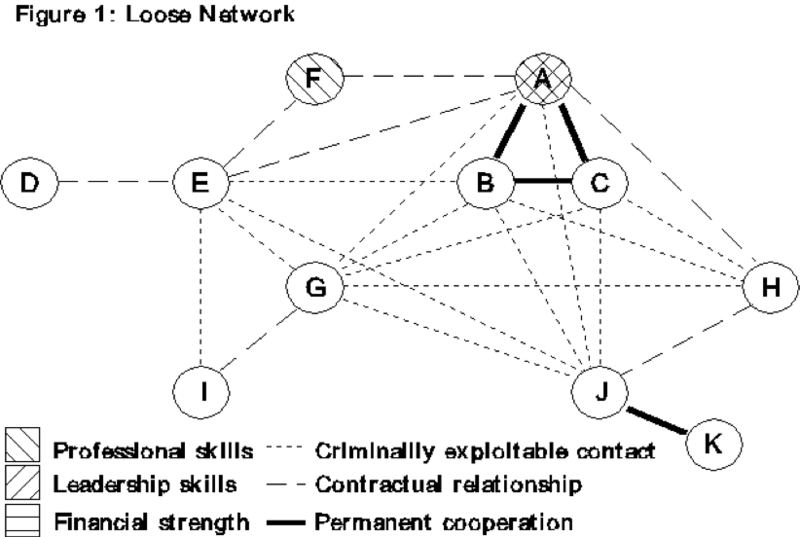 Criminally exploitable contacts, i.e., mere acquaintances of two actors who know each other as members of the crime network, thus establishing a minimum of trust that is the precondition for criminal cooperation. 2.) Contractual relationships, i.e., those exchange patterns that are confined to specific projects or a specific set of activities with no obligation other than that of the fulfillment of the terms stipulated in a particular agreement that may be formal or informal. 3.) Cooperation on a permanent basis, i.e., a more complex and enduring pattern of interaction and a higher degree of commitment. The classical image of underworld structure had been that of a loose network of small task forces and individuals who were ranked in an informal milieu-hierarchy based on professional reputation (Kerner, 1973), as shown in figure 1. In the fictitious example used here, 'A', 'B', and 'C' are car mechanics who work as a team in the stolen car business. (3) 'A' is something of a boss because he has leadership qualities apart from his technical skills. But in general he is not much more than a primus inter pares (first among equals). The 'A-B-C-'gang may steal cars themselves or procure them from thieves or fences like 'H' who in turn buys from car thieves like 'J' and his accomplice 'K'. At the same time, 'A', 'B', and 'C' may offer their services, such as repairing locks that have been destroyed in the act of stealing, on a contractual basis to other operators in the stolen car business. When the 'A-B-C-'gang needs false documents they go to 'F', who is a skilled forger. Other actors operate on the distribution end. While 'E' maintains an exclusive and profitable business relationship with big-time fence 'D', 'G' specializes in exporting luxury cars and sometimes uses small-time criminals such as 'i' to drive the cars across the border. Most of the participants (A, B, C, E, G, H, and J) know each other, by, for example, frequenting the same bars. In contrast to this scenario, Kerner (1973) observed the emergence of a new kind of vertical differentiation that is structured around a division of labor and capital. Background organizers coordinate illegal operations and provide the necessary finances while professional criminals carry out the actual crimes. 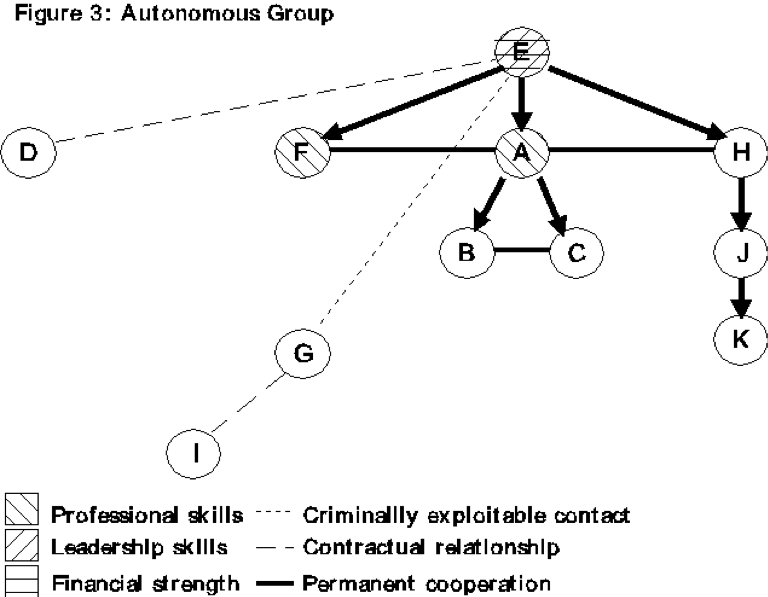 This businesslike system, which by 1970 already existed on an international scale (Kerner 1973), implies that those acting as background organizers have acquired their positions in the crime network by accumulating and reinvesting capital instead of spending all proceeds from their activities in luxury consumption as most criminals apparently do. Cooperation between entrepreneurial and staff levels is maintained through voluntary subordination of the latter. This appears to provide benefits for both sides. For example, (figure 2), background organizer 'E' can effectively coordinate the activities of 'H' and 'A/B/C' by placing orders for a certain model with middleman and fence 'H' according to 'D''s customer demands and by advising 'A/B/C' on what spare parts, e.g. door locks, to order in advance. 'A/B/C' and 'H' are relieved from certain entrepreneurial tasks while 'E' is insulated from the actual handling of stolen goods provided he has the transport from 'A/B/C' to 'D' done by someone other than himself. Kerner (1973) reports that at the time of his study such arrangements did not manifest themselves as permanent organizational structures. Instead, background organizers drew from a pool of various, often fluctuating groups and individuals who join for certain projects and then disband. However, he anticipated the evolution of formal organizations out of enduring patterns of cooperation. In a third scenario,criminal groups appeared to be dominated by one or several leading figures who run operations through a permanent staff, which in turn may hire network members at need or direct a permanent troupe of helpers. The cohesion tends to be based on firm leadership rather than on contractual or primus-inter-pares-arrangements, i.e. the ties between the participants are of a permanent nature and the activities on the staff level are prescribed by key figures rather than negotiated among the participants. In the example (figure 3) this would mean that the ties between 'E' and most of the other actors have a direction. The same applies to the relations 'A'-'B/C', 'H'-'J', and 'J'-'K'. 'E', being the head of a criminal organization, would decide on what projects to undertake, he would assign specific tasks to the participants, and he would select outside business partners. As a result, from all participants in this operation only 'E' appears as an independant actor in the illicit market. 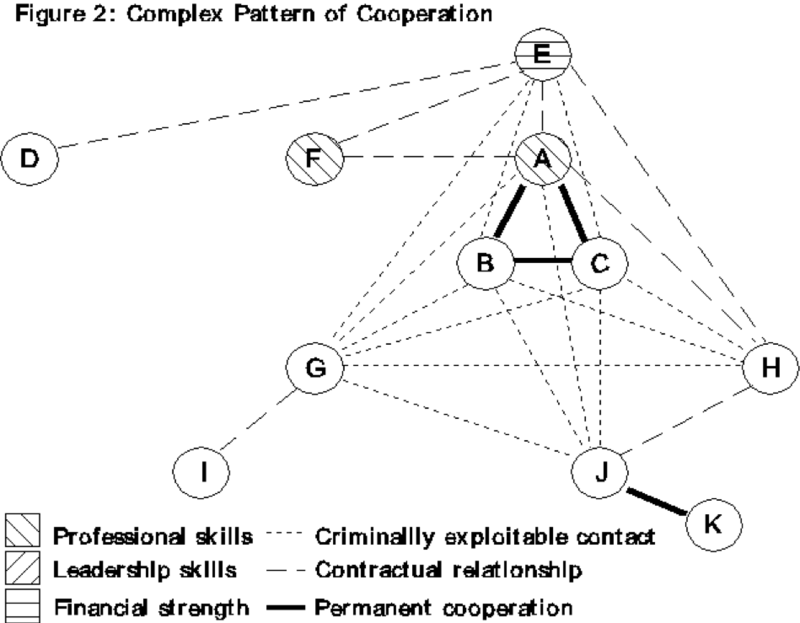 ...regardless of the existence or nonexistence of clearcut organizational units, from the law enforcement point of view the vertical and horizontal differentiation taking place in the patterns of cooperation among criminals, leading to greater complexity of criminal operations and insulation between participants, constituted a major problem. ...The most recent study on organized crime by Sieber & Bögel (1993) is the first one conducted in the post Cold War era. With the borders open to the East it does not come as a surprise that they register an increase in importance of foreign criminal groups. Sieber & Bögel apply the concept of business logistics to the study of trafficking in persons and stolen motor vehicles, prostitution, and illegal gambling. They find that, with the exception of German-run prostitution, all of these areas are dominated by "strictly hierarchically structured organizations" (1993, p. 6). By this vague term they apparently refer to the structural similarities between legal and illegal businesses. The hierarchical distinction between managerial and staff level that can be found in any production firm does exists, for example, within a complex stolen car operation.